This entry was posted in Skip Allen & Painter 11 and tagged Alpha Channels, Digital Art Academy, Eastern Water, Skip Allen, Sumi-e Painting. Bookmark the permalink. I started using Painter in June of 2008 and couldn’t get anywhere. I had my first class in Septemper of 2008. I have always worked sculpturally; 2D has been just outside my reach. From my experience, I believe anyone can produce very nice work using Painter. But it is like blogging…you have to keep doing it to hone your skills. Open up Painter and give it another go. It is so much fun. Skip – your work is unbelievable. I love it. This bamboo would look amazing on silk. Do you market these paintings? Where, what form?? I do not market my work; as a matter of fact, I haven’t printed anything in over a year. I do appreciate that you think I could market the work. But for the moment, I just enjoy painting for fun and pleasure. Interesting comment about silk. 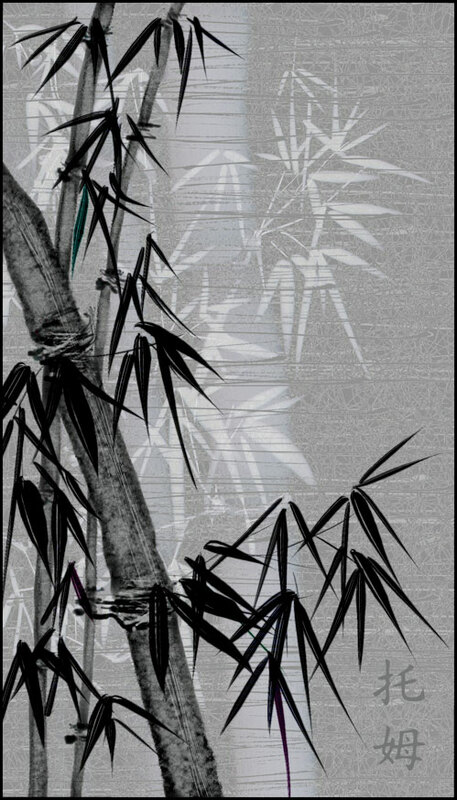 I just finished another bamboo with a texture that makes it look like it has been printed on silk. I’ll post it soon. I agree that this one looks more digital than some of your other works. I know that some people have issues with digital works of art but I say Phooey! Digital art can be masterful and full of nuance and creativity. It is just another type of art, it is like saying wood carving isn’t a real “art form”. Yep, some folks do have issues with digital stuff. I had a grand time speaking to an artist guild in the area. I brought my computer and projected the my computer screen so all could see me paint. Before the meeting I heard a number of folks say some rather negative remarks. Afterward, there were lots of questions and positive feed back. All were stunned at how it looked like I was painting with real media. It was a fun night for me.